Restaurants in the UAE have been told to throw out Japanese-made Kikkoman soy sauce due the brand having alcohol in some of its products. The UAE Ministry of Environment and Climate Change said “several samples of the product with different production dates violated the rules”, a news release read. “The decision came based on the results of tests conducted by specialised accredited laboratories, which confirmed that several samples of the product with different production dates violated the rules”, the ministry added. The sale of alcohol is controlled in the UAE and only available from special licensed outlets and licensed hotels and bars, sold under certain conditions. Officials said Kikkoman sauce that was specifically produced in Japan was being targeted, suggesting that was the type that contains alcohol. The food manufacturer has production plants and offices in the US, Netherlands, China, Canada, Singapore and Taiwan. The ministry did not elaborate. Kikkoman sauce is a naturally brewed product like wine or beer. According to the company’s website, it is made from soybeans, wheat, salt and water. During the fermentation process, the wheat starches are broken down to sugars and part of the sugar is changed into alcohol. 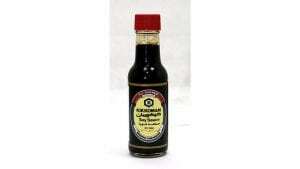 “The alcohol adds to the aroma and overall flavour of our soy sauce,” the company stated on its website. This product contains approximately 1.5 per cent – 2 per cent alcohol by volume. Chefs and Japanese restaurants said they were surprised at the move and were not aware the sauce contained alcohol.Andre Raspin is the manager of Prax’s Restaurant in Dubai’s Barsha Heights and has been serving Kikkomen to customers in Dubai for 15 years. “This is a big surprise as Kikkomen is the best soy sauce on the market,” he said. “It is very strange. Now it is known this has an alcohol content, what affect will that have on its import into the UAE? “The Government is very strict on its laws and regulations, as we know with Halal meat, so it is surprising this has only been discovered now. Prax’s has a centralised kitchen that prepares a huge variety of sauces off site.“We will wait for further direction from the management,” said, adding that he would likely have to find a cheaper Chinese alternative. Yannick, who is head chef at Sushi Counter in Dubai Media City, said regular Kikkomen soy sauce has already been replaced by the restaurants own recipe. “We have used Kikkomen, but now my superiors have said to not use it anymore,” he said on Tuesday evening, just hours after the ban was announced. “We have our own brand of soy sauce now. I had no idea this had an alcohol content.